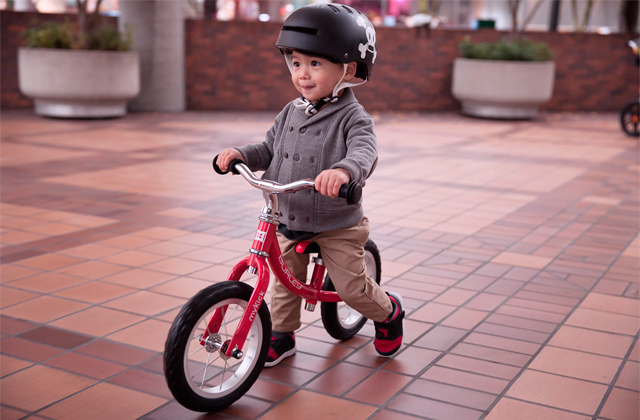 The seat turns in any direction 360 degrees, allowing parents to turn their kid around entirely and reach all hard-to-get areas with minimum effort. The max weight limit isn't that high. 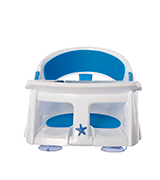 The Safety 1st bath seat can help you make the transition from a baby bath to a big bath safe and joyful. 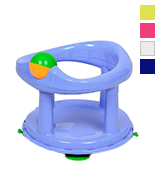 The rotating ball will occupy your baby, while 360-degree swivel function will help you reach every tricky area. The seat is featured with a colour-changing starfish - heat sensing indicator. The blue colour changes to grey if the temperature becomes too hot. The foam pads might come off over time. 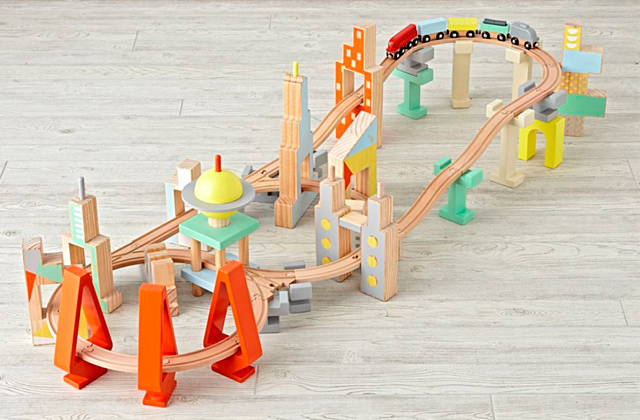 If you have a particularly fidgety kid, this seat may be the best match for you. With anti-slip foam pads and extra-strong suction cups, the Dreambaby seat will keep your little one secure and comfortable. The exterior layer of soft TPE material warms almost instantly to your baby’s body temperature and bath water. The suction cups aren't very strong. 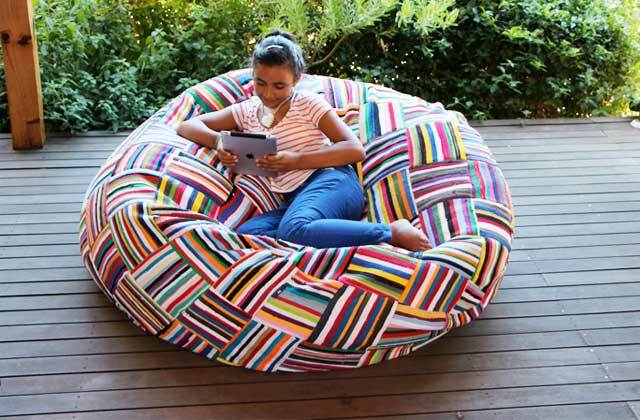 If you need a comfy seat that would require low maintenance, this is a good pick. With self-drain design and soft TPU exterior, it will deliver a relaxing, enjoyable bath time experience for parents and babies. The plastic seat has a matt surface to let your baby sit comfortably without slipping. The armrests and the extra-wide backrest also contribute to greater stability. It's quite difficult to unfasten. The Rotho Babydesign baby seat is made in Germany. It's stoutly-built and can serve for long years to come, for many babies. It ensures a safe hands-free washing and playing experience. The seat is very lightweight and portable. Unlike many other models, it can be neatly folded for convenient storage and transportation. A lot of water gets trapped inside the seat. Dreambaby offers you a good basic seat that won't break the bank. 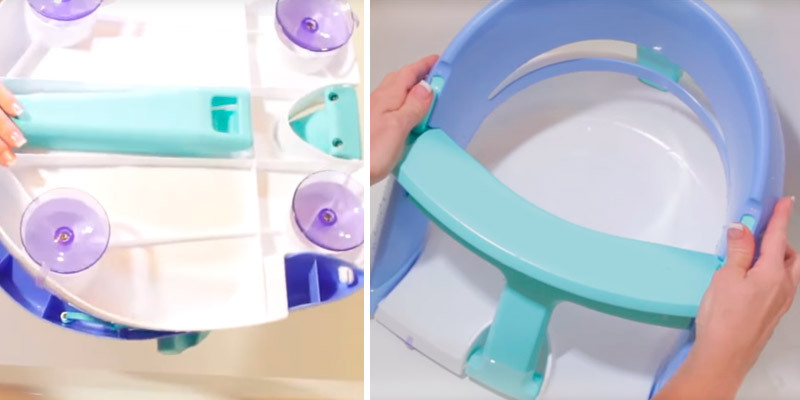 It's the best baby bath seat for bigger kids and those families that travel a lot and need something portable. Available in Blue and Pink. 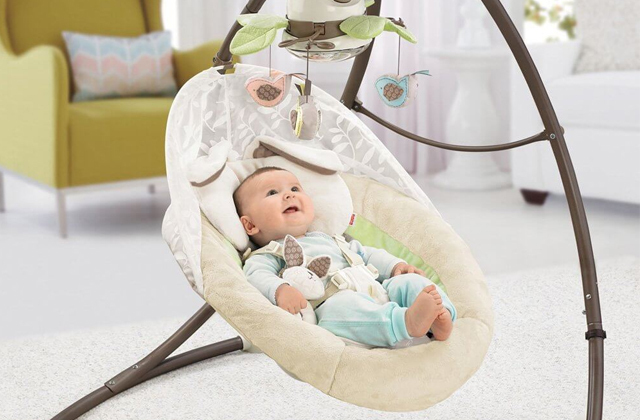 Safety 1st is a reputable brand all over the world that brings parents high-quality products designed to support babies at every stage of their life. Designed with the smallest babies in mind, the Safety 1st bath seat can help you make the transition from a baby bath to a big bath safe and joyful. The main perk of the seat is certainly its unique design. It's made with a rolling ball at the front that spins and amuses children. 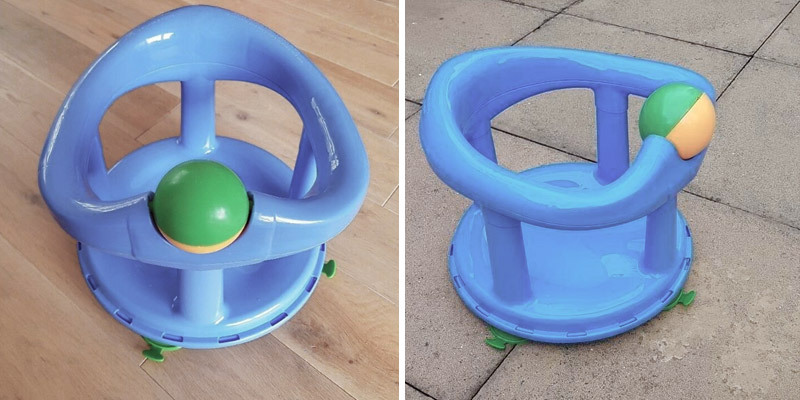 And even if your baby is usually too busy splashing to play with the rotating ball, it's a nice addition to have just in case. As a nice touch, the seat is featured with a 360-degree swivel that simplifies bath time for parents significantly. 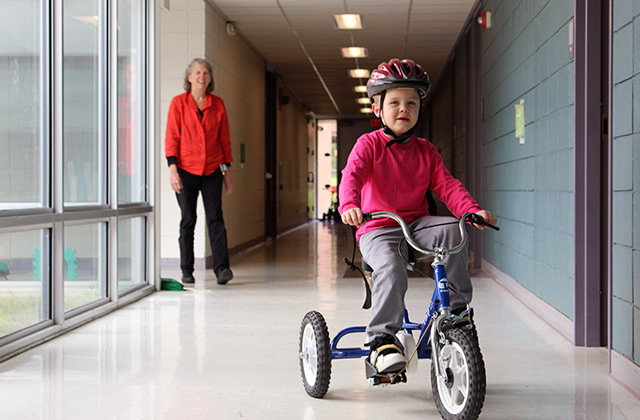 The seat turns in any direction 360 degrees, allowing parents to turn their kid around entirely and reach all hard-to-get areas with minimum effort. The seat has four suction pads that stick onto the bath extremely well to secure it in place. The seat doesn’t move unless you really force it. Safety comes first. The Safety 1st seat has an ergonomically-shaped backrest enabling babies between 6 and 12 months to sit in the bath independently, leaving your hands free for bathing. However, the weight limit of this chair makes 10kg only, meaning it may not be the best option for bigger babies. But if that doesn't go for you, we see no reason to deprive yourself of the ultimate comfort and convenience this seat can bring. 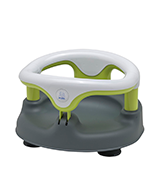 The Safety 1st Swivel Bath Seat is very fun, safe, and supportive. The Dreambaby Super Comfy Bath Seat is designed to bring your baby as high level of comfort and convenience as possible. Whereas many other bath chairs on the market are generally made with a bare plastic backrest, this one boasts extra cushioning for greater comfort. The material is soft and supple to deliver a bit of comfy back support. 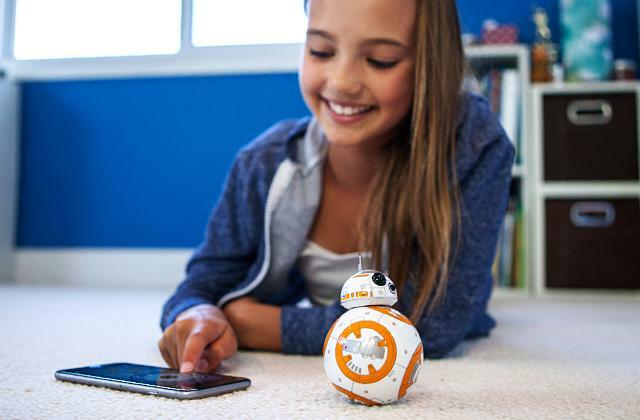 Plus, the padding prevents fidgety babies from slipping or slouching. The only thing you should be aware of is that the foam pads might come off over time. So, it's recommended to dry out a seat after each use. Another thing that parents of active babies will definitely appreciate is the larger-than-usual suction cups on the bottom. The suckers are very strong and create a very safe, secure fit in the bathtub. They work a treat, keeping the seat from moving. Speaking about design, we can't skip the unique Heat Sensing Indicator. Right on the front, there's a colour-change starfish warning you if the water is too hot. The blue colour changes to grey if the temperature becomes overly hot, which is a very useful addition for new parents. The last but not the least feature worth your attention is the front opening bar. The front bar section clips in, making it a lot easier to get babies in and out. It prevents a small baby's legs from jamming and hurting. In all, if you have a particularly fidgety kid, this seat may be the best match for you. With anti-slip foam pads and extra-strong suction cups, the Dreambaby seat will keep your little one secure and comfortable. 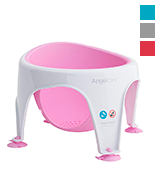 The Angelcare Soft Touch Bath Seat is a nice-looking and comfy product designed with both babies and parents in mind. Made from lightweight plastic and a soft-touch TPE material, it can provide your baby with a very comfortable experience during bath time. The exterior layer of soft TPE material warms almost instantly to your baby’s body temperature and bath water. And since the soft-touch material comes up to the right temperature that quickly, kids will experience no temperature jumps and discomfort sitting in the seat. Moreover, the seat has been ergonomically designed to conform to the growing bones and hold your baby securely. However, no product is flawless, and if you'd ask us to point out some design issues, we would say that the suction cups aren't very strong and might not cater to very active babies. On the positive, the seat has a "Max fill" line helping you to ensure the optimal level of water in your bath. The water covers babies just enough, so you can be sure your infant won't get his or her head under water. But what really sells the product is its hygienic properties. 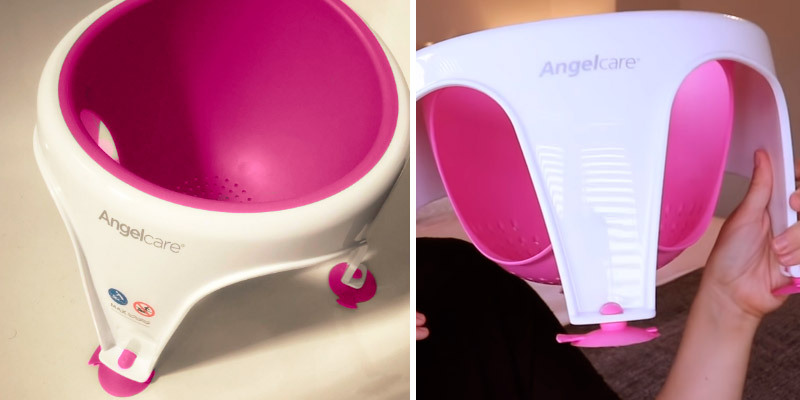 Unlike most other models that hold water in the bottom and require to be popped up after each use, this one is cleverly designed with drain holes in the seat, allowing soapy water to pass through with zero effort from you. Thus, no water will collect inside and turn into mould. 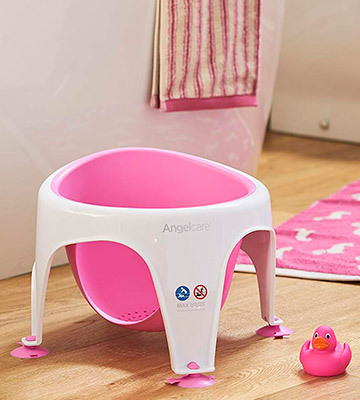 So, if you need a comfy seat that would require low maintenance, the Angelcare Soft Touch Bath Support is a good pick. It will deliver a relaxing, enjoyable bath time experience, leaving you more time to spend with your family. If you're looking for an extremely durable bath seat that can stand up to the rigours of daily use, you should seriously consider this one. Rotho Babydesign is the German brand that has been developing clever solutions for parents and children for more than 15 years now. Their products are high-quality and full of innovations, and this seat is no exception. The Rotho Babydesign seat lives up to expectations from German products. It's stoutly-built from solid plastic. The material used here is thick-walled, durable, and BPA-free. 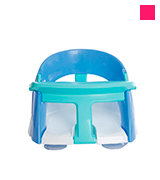 The plastic seat has a matt surface to let your baby sit comfortably without slipping. The armrests and the extra-wide backrest also contribute to greater stability. For easy getting in and out, the seat is equipped with an openable ring at the front. Take note though that you have to push the two safety bolts on the underside of the ring and use your both hands for unfastening. This design, however, makes it impossible for kids to open the ring unintentionally. 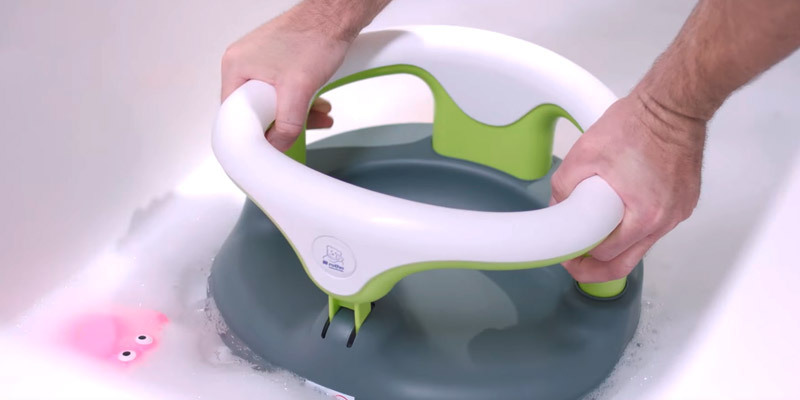 Underneath the durable plastic baby bath seat, there are four strong suction feet which provide a firm hold either on the bathtub base or shower base. 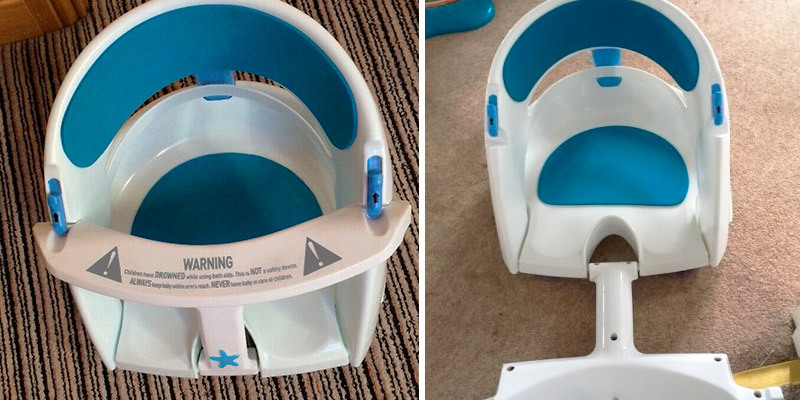 Once bathing time is over, you can quickly remove the seat by simply pulling the side straps. Overall, the Rotho Babydesign is a stoutly-built baby seat that can serve for long years to come, for many babies. It ensures a safe hands-free washing and playing experience. Right off the bat, we would like to say that Dreambaby Premium Bath Seat isn't actually a "premium" product as you may expect from its name. It's a basic seat that has no extra bells and whistles to pay extra money for. 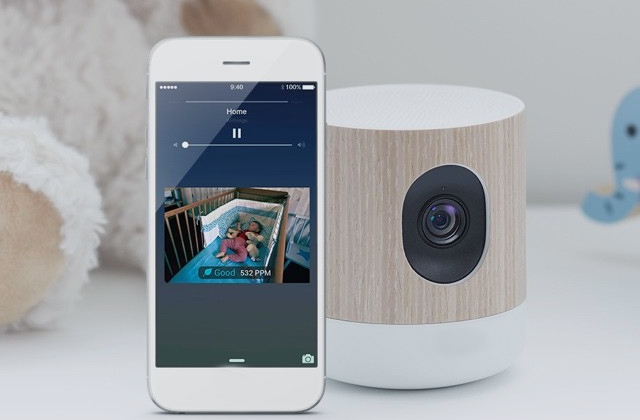 It's more affordable than most other options on the market yet does its main job as expected - provides a good level of security and support for infants that can already sit without extra assistance. 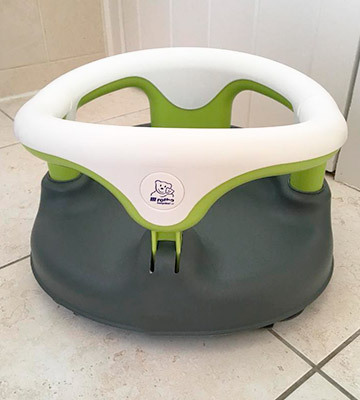 It's suitable for ages from 6 months until a toddler is able to stand. Basically, it supports weight up to 13 kg. The seat itself is very lightweight and portable. Unlike many other models, it can be neatly folded for convenient storage and transportation, which makes it an appealing option for families that travel a lot. Another thing worth highlighting is that it's a quite spacious seat great for bigger babies. The large seat provides ample room for kids to grow, while the front support bar keeps them reliably in place. The front support bar is easy to lock and unlock, making it possible to sit your baby in without having to fit his/her legs through tricky holes. But that bit gets full of water, hence, you'll need to leave the seat lying on its side so that the water comes out and the mould doesn't grow inside the bar. Other than that, we found no serious flaws. To round things up, it's a basic seat that won't break the bank. It's a good option for bigger kids and those families that travel a lot and need something portable. What Is a Baby Bath Seat? 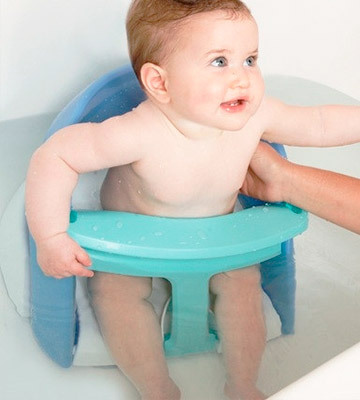 As soon as your infant can sit upright without extra assistance, it means he or she has already outgrown a baby bath tube and needs some sitting alternative. But bathing in a large bathtub can be not only exciting but also too slippery and dangerous. That's why a baby bath seat is a perfect solution to ensure the comfort and safety of your little one. 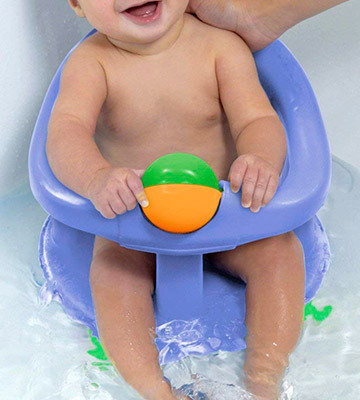 With a baby seat, bathing will become a relaxed and joyful experience for both parents and kids. 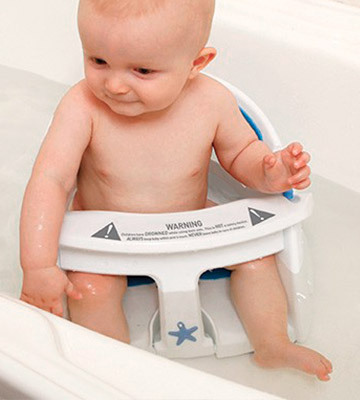 It provides optimal support in the bathtub or shower and helps you do bath time “hands-free”. Only when children start bathing in an upright position rather than lying down are they able to maintain their balance independently and enjoy bathing to the fullest while splashing and playing with their toys. But bear in mind that even though a bath seat keeps babies seated, they still need to be under the supervision of an adult. Also, you should follow some rules and tips to make bathing as safe as possible. Another must-have thing you'll need in your household once your baby is able to sit independently is a high chair. 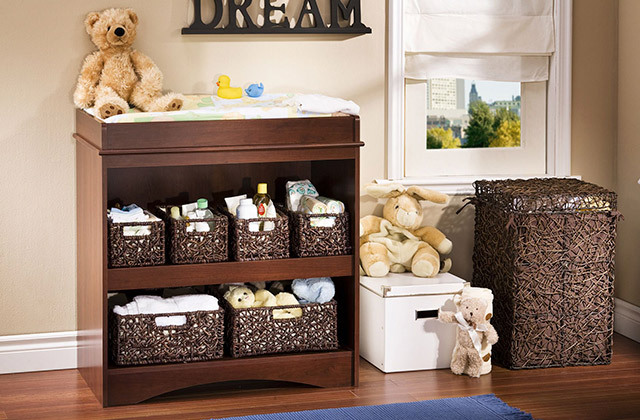 It can become a perfect spot to feed, play, and spend time with your little one.